Rheumatoid arthritis (RA) is a chronic inflammatory disease that eventually results in severely swollen and deformed joints. In RA, the immune system, which helps the body rid itself of infections or tumors, attacks the tissue lining of a joint, causing inflammation. The reason this happens is not clear. With continued inflammation, the tissue (known as synovial tissue) becomes thickened and begins to grow into surrounding cartilage and bone. 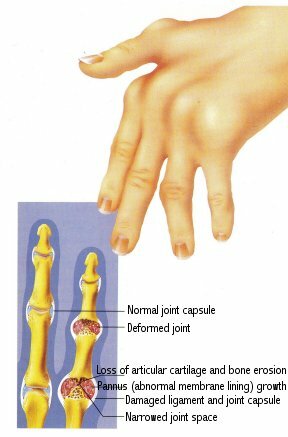 Eventually, the joint becomes destroyed, resulting in joint deformities. There is a strong genetic risk for developing RA and it is three times more common in women than men. Rheumatoid arthritis usually affects joints in the hands, wrists and feet, causing swelling and pain. Rheumatoid arthritis (RA) is a chronic inflammatory disease that affects two to four million Americans. It is much more common in women, especially when symptoms develop between the ages of 15 and 45. People with an inherited susceptibility develop RA after they are exposed to an initiating agent, but this agent has not been identified. The disease results when the immune system begins to attack body tissues. Over time, RA will worsen and in some patients it develops rapidly into a severe, disabling joint deformity. Some people have a break or remission in their disease that can last up to a year or two. There is no special laboratory test for RA and it is diagnosed on the basis of signs and symptoms. However, persons who have an inherited susceptibility to the disease can be identified by a blood test. X-rays can also show erosion of the joints in hands and wrists. Symptoms of RA: The usual signs and symptoms of RA include morning stiffness in and around the joints, lasting at least one hour; swelling of the finger or wrist joints; swelling of three or more joints; joint swelling in both left and right hands or wrists; and lumps that appear just under the skin. Other symptoms include feelings of tiredness, weakness, poor appetite, stiffness and aching in the muscles and joints. Affected Joints: The joints usually affected by RA are those in the hands, wrists and feet. Less often, swelling and pain may occur in the elbows, shoulders, hips, knees and ankles. The joints that are affected and the severity of the swelling and deformity determine how well the patient is able to function in daily activities. As the arthritis worsens, the ability to perform daily chores or work becomes more difficult. Besides swollen joints, other symptoms may appear in about 20% of patients. Nodules or small lumps under the skin may be seen on the elbows, arms, hands or feet. Complications in the lungs, eyes and heart may also occur. Treatment of RA: Rest, physical therapy, surgery when appropriate and medications to ease pain and reduce the inflammation are current treatment options. Physical therapy includes special exercises to keep joints and muscles limber. Rest helps avoid aggravating the inflamed joints. Surgery is sometimes called for to remove the thickened synovium. This may temporarily relieve swelling and pain in a joint. If severe arthritis occurs in weight-bearing joints, joint replacement surgery may be necessary. Medications are chosen based on the severity of the disease. For mild cases, non-steroidal anti-inflammatory drugs (NSAIDs), such as aspirin or ibuprofen, in high doses may be used. If they do not work, other drugs such as gold, penicillamine and hydroxychloroquine are added to the NSAID regimen. In some patients a corticosteroid may be used for a short time while waiting for the stronger drugs to work. The strongest drugs, immunosuppressive agents such as azathioprine, cyclophosphamicle or methotrexate, are saved for patients who do not respond to any other treatment. Drugs used to treat RA may have potentially serious side effects. Stomach-upset and bleeding are common. All drugs must be taken exactly as directed. Patients should be familiar with the specific cautions for each drug. 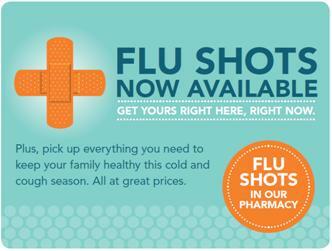 Don’t hesitate to ask your doctor or pharmacist if you have any questions or concerns.